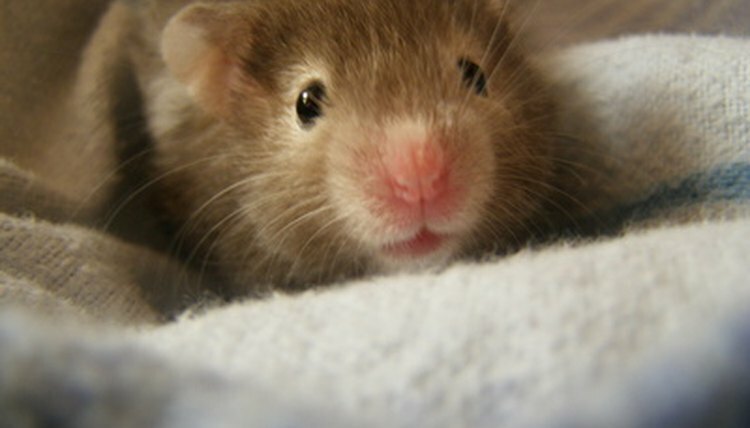 Your hamster is typically one of five pet breeds -- Roborovski dwarfs, dwarf Campbell Russians, Syrians, dwarf Winter White Russians or Chinese -- that live approximately two years. During that time, let him see you as loving, trustworthy and fun to help overcome his natural shyness and connect with you. Meet your hamster's needs so he feels secure. Give him a cage with plenty of room, bedding, a hiding spot, fresh food and water, and a wheel to run on. When he is properly cared for, it will lessen his fear of the humans caring for him. Approach your hamster initially only under the right conditions. Do it when he is awake -- this means late, usually -- in a setting that has become familiar to the hamster. For instance, interact with him while he is in his cage with the normal family noise level in the background. Avoid touching him when the television is turned on or the dog is barking. Place your hand in the cage and allow your hamster to approach it when he is ready. He may sniff and nibble. Avoid touching him the first few times you perform this exercise. Do it several times a day, for several days. He'll likely touch you at some point; you may move forward. Offer healthy treats such as or fruits and vegetables to your hamster every other day or so. Give little bits, not big pieces. Initially put them in the food dish, and pet your hamster while he eats to get him used to your touch. Work your way up to holding the treat on your and, and eventually holding him as you give him the treat with your other hand. Pick your hamster up gently every time you do so. Place your hand around his abdomen and scoop him out of his cage if he doesn't learn to step up onto your hand; never pick him up by his tail, which can be painful. If you're causing your hamster pain, he will not be interested in bonding. Allow your hamster to climb on you. Let him run along your arms, shoulders and body so he becomes familiar with your scent. Pet him as he explores; your gentle touches will increase his trust level. If he is a faster Robo variety or skittish, keep him in a contained area -- such as a small bathroom -- so he cannot escape. Groom your hamster to keep his coat clean and shiny. Clean short-haired hamsters by running your hands down their bodies. Use a small, soft-bristled brush with long-haired varieties once a week to remove any debris that may be clinging to their coats. Get your hamster out of his cage several times a week for play time. Whether he is climbing on you, playing in hamster ball or allowed to run in a different area -- such as a second hamster cage with different toys for a change of scenery -- he will associate your presence with fun.  Once your hamster is used to you, put him in his ball to run around every evening; this will help him associate seeing you with fun time.  The level of bonding you achieve with your hamster will depend on his comfort level and personality, as well as how much time you take to socialize him. ⚠ Roborovski's dwarf hamsters are skittish and fast; they typically will not bond over food. Patience and continual interaction helps them overcome their fear of you.